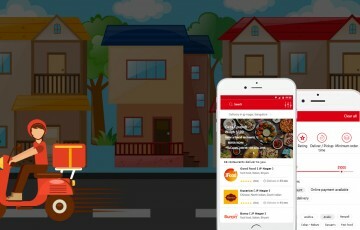 It seems like world is getting inclined towards On-demand delivery services managed by applications. And why not, if customers are able to avail services with such an ease. On-demand services have captured huge range of industries like food industry, garment industry, foot-wear industry, transport industry, parcel and courier industry etc. If we take example of parcel and courier services, Do customers really want to visit courier offices in this modern era? I don’t think so. And why they will visit if they can access the services on their finger-tips. The comfort level that applications provide is the basic factor behind the popularity of such applications. On-demand parcel and courier delivery applications are huge in demand. This is one of the best business models for startups. These applications enable people to send packages within same city or other cities from their door step for a small delivery fee. The delivery processes completed with simple work algorithm. Customers can request for parcel delivery services via application at their preferred time and location. Industry has witnessed huge rise in on-demand parcel and courier delivery service startups. So let’s see why on-demand parcel and courier delivery applications are so much in demand. 1. Easy Log in/ sign up. ? Easy to use UI/UX. 6. Different modules for different users and admins. 7. Easy cancellation and re-scheduling. 9. Push notification and newsletter alert. ? Different payment gateways. 1. On-demand parcel and courier delivery applications facilitate customers to schedule pick-up and delivery according to their own preferences (time and location). Customers just have to install the application, and they can access it on their fingertips. These applications made parcel and courier delivery more convenient than ever before. 2. One of the major factor behind popularity of Ondemand parcel and courier delivery applications are they are ready to serve 24*7. Customers can request pick-up and delivery any-time and anywhere they wish. 3. On-demand parcel and courier delivery services are transparent. Customers can track their parcel through the application. Customers will get exact pick-up time, estimated delivery time, delivery route, delivery staff info and step-wise information. 4. These applications take care of customer satisfaction. They facilitate customers to rate and review the services provided. It will be helpful for other customers to judge the quality of services. 5. On-demand parcel and courier applications ensure quick delivery of the parcel within minimum time. There are also separate feature like “opt for quick delivery”. This special feature will deliver the parcel in minimum possible time for some additional charges. 6. These applications have features which makes chargeable delivery fee transparent to the customers. Delivery charges simply depend upon the amount of parcel and distance covered.